Film is, and always has been, an escapist fantasy, exhibiting events that wouldn’t otherwise happen in real life but still set out to entertain its audience by letting them indulge their wildest dreams. but still set out to entertain its audience by letting them indulge their wildest dreams. Writer-director Nancy Meyers has made a strong career out of escapist fantasy films, many if not all of them up to this point being solely romantic-comedies; from the transatlantic house-swapping escapades of The Holiday to a freak accident leading to sudden telepathy in What Women Want, Meyers’ filmography is nothing but pure escapist bliss. The tradition continues with her first film in six years, and sixth overall as writer-director, The Intern – which may be Meyers’ most accessible movie to date, but also one of her most charming and likable. 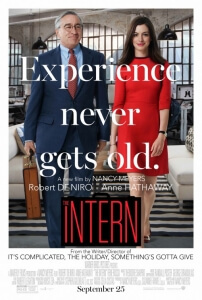 And it’s FAR better than the similarly-titled-but-otherwise-unrelated The Internship, which is always a plus. 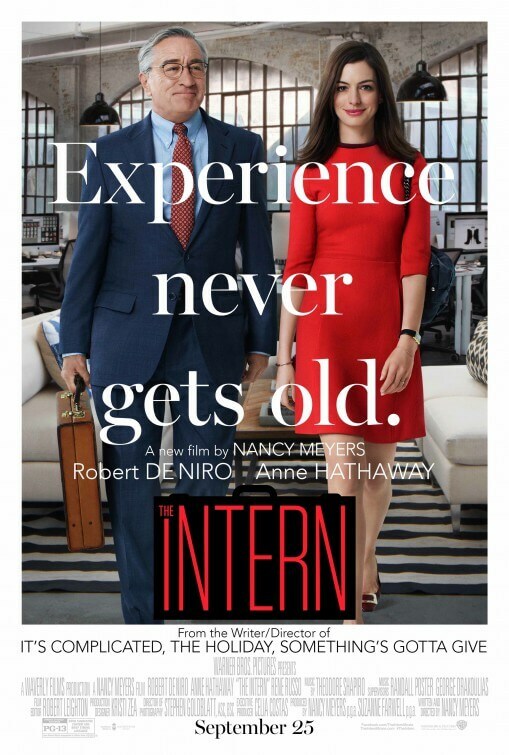 The titular intern is Robert De Niro’s retired widower Ben, who is desperate to fill a hole in his life when the pleasures of retirement aren’t enough. He comes across a senior internship program for a start-up clothing company, and naturally gets the position; he also ends up being assigned as a personal intern for the company’s founder Jules (Anne Hathaway), an exceptionally busy employer who at first has no use for him, but over time finds he’s more than just a handy intern. If you read that last part and started getting some disturbing thoughts in your head, then relax: this isn’t the kind of movie where the two leads become a couple by the end (thank goodness!). After all, Hathaway’s Jules is married to a seemingly cool guy (Anders Holm) and mother to an adorable young girl (JoJo Kushner), while De Niro’s Ben is getting familiar with the company’s resident masseuse Fiona (Rene Russo). However, that doesn’t stop Hathaway and De Niro from having excellent chemistry together, harbouring a mutual respect for one another and eventually planting the seeds for a nice little friendship between one another. Individually, both excel; De Niro hasn’t played such a genuinely lovable character in years, and he’s more than up for the task, while Hathaway gets some great moments to shine in a role that could have so easily been underwritten, something that Meyers is all too keen not to let happen. Plus, more movies need Feminist De Niro mannerisms as in this one, and we can see a Tumblr page being born out of this – just sayin’, get on it, Internet. There’s also a lot of likability to go around outside of the main friendship, with a solid supporting cast of characters that are quirky but never annoyingly so, and a good amount of heart that is hard not to resist. What we will say, however, is that sometimes the over-sentimentality of certain scenes can be a bit too heavy-handed at times, as is the case with most of Meyers’ previous films, and the lack of real conflict lends it a light and breezy touch that will certainly put off anyone looking to be challenged by this kind of film. At just over two hours, it’s also perhaps a little longer than it needs to be, with half an hour being easily cut or trimmed down to make it a slightly quicker sit. These are just minor niggles, though, and they don’t outright ruin the movie. When you add up all the components together, it’s easy to understand why a film like this, with its upbeat and sentimental tone as well as its blatantly inoffensive nature, will attract the cynics as much as it does the appreciators. We can certainly see people dubbing it one of the whitest movies of the year, for a few very good reasons, but like most films that fall into convention it’s all in the execution; Meyers has, admittedly, delivered crowd-pleasing escapist fantasies in the past that have truly been effective, where couples can watch peacefully with one’s head resting on the other’s shoulders, and this is no exception. Though it may lack actual meat or heft, The Intern is safe and harmless for all the right reasons, and is destined to become a new favourite amongst fans of Meyers’ work. But seriously, Tumblr; get that Feminist De Niro page up and running. We’re anxious to see what you’ll do with it. The Intern may not have a great deal to say, but its charming fluffiness and likability, as well as its warm and beating heart powered by the irresistible duo of Robert De Niro and Anne Hathaway, is enough to forgive its more obvious flaws.